If you are looking for a simple dessert, or Valentine’s Day treat, then the recipe for today’s Cooking Through My Collection series is just for you. 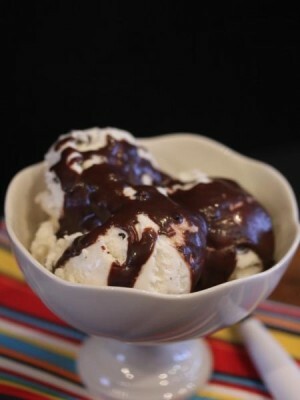 You really can’t go wrong with chocolate mint sauce over ice cream. This recipe comes from Alton Brown’s cookbook I’m Just Here for the Food: Version 2.0 . 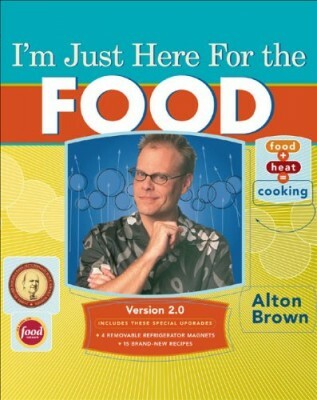 I first discovered Alton Brown a few years ago thanks to my friend, and blog designer, Joy. I have watched Food Network for years. I watched it way back when Emeril was new to television and he was the star of the network. That was also way back when Cooking Live was on Food Network. I loved that show as well. I still enjoy the shows on the Food Network, but some of those early shows are still my favorite. Some how though I missed watching Alton Brown back when he first started on Food Network. I knew who he was, but did not really pay attention to his show. That was until Joy told me about him. I love the science behind cooking, so when I heard Joy talking about how much her family loved Alton Brown, and why they loved the show, I knew I would enjoy it. After watching one episode of his tv show Good Eats, I was hooked. I loved it. My girls and I have watched many episodes of Good Eats and we have learned so much. And Alton makes learning fun in Good Eats, his style is perfect for teaching the science of cooking to kids. Shortly after my girls and I started watching Good Eats, my husband bought me several of Alton’s cookbooks for my birthday, and I loved them as much as I did Good Eats. Many of Alton’s recipes can be found online and the Food Network site, but what I love about the cookbook, I’m Just Here for the Food: Version 2.0, is all the information behind the recipes that is included. There are a lot of extra tips, ideas, information, and science added throughout this cookbook. And that information can be applied to many areas of cooking, not just the recipes in the book. Who else loves Alton Brown and Good Eats? I am sure some of you must be an Alton Brown fan too. Now for the recipe. I have tried quite a few recipes from this book, but I wanted to choose a new one to try for this series, and the chocolate sauce caught my attention. 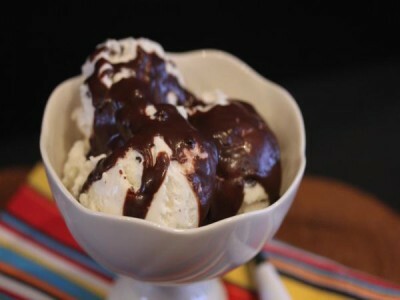 I have made quite a few hot fudge type sauces over the years, but this chocolate mint sauce is one of the best I have made. I mean really, with heavy cream, chocolate, and cocoa, how can it be bad. It was so good served over ice cream. And my kids have plans to use the leftover sauce in a glass of milk, which I think will be very good. I will admit though that this is not an everyday type of recipe. Now, don’t get me wrong, this is delicious, but with ingredients like this, it is a special occasion treat, which makes it perfect for Valentine’s Day. In a pan combine cream, corn syrup, butter, cocoa, and salt. Bring to a boil. 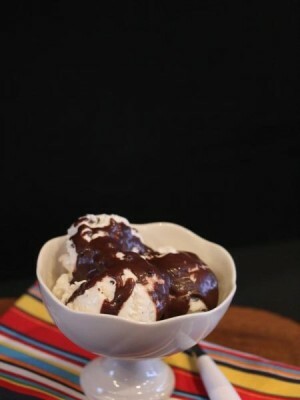 Remove from heat and add bittersweet chocolate and let sit, without stirring for 5 minutes. Add peppermint extract and whisk gently until well combined and chocolate is smooth. Serve over ice cream or other dessert.